I am wary of first time commenters that have something to sell, so I typically “moderate” such comments and decide whether to allow or delete any comments with a clear commercial bent. Having said that, I do, however, often encourage small scale artisanal producers to help them find markets for their products. A couple of things kind of annoyed me about this recent comment, so I thought I would write this post so that Ms. Rose would pay more attention to internet etiquette before launching her permanent commercial website that is apparently still “under construction”. First, if you want to promote your site, say it out front. Don’t pretend you are someone else trying to help out my readers by sending them to a site you identify. In this case, Rose, the site is yours, and you can’t THINK their site is pilinutfarms.com, you KNOW for a FACT it is that site, because you leave it as your email address and trackback link. Perhaps it’s just a language issue, but I don’t think so. As for the “healthiest chocolate bar ever recipe” you refer to “on your site”, yes, you have a LINK on your site to the video, but the original source of the video is from youtube, “The Amazing Things Pili Nuts Can Do! Episode 729” and posted by “Matt Monarch” of the rawfoodworld.com. 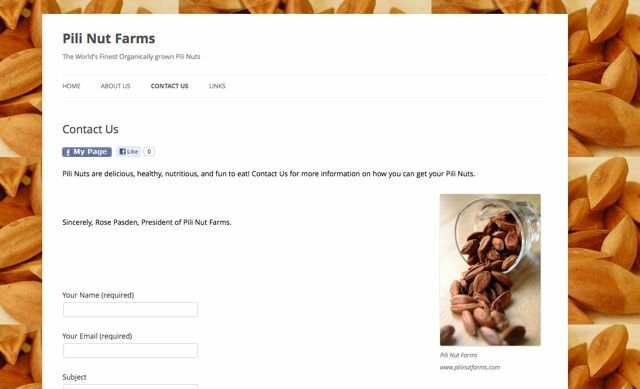 So you did not LITERALLY mean we could find “the most delicious recipes at Pili Nut Farms.” Perhaps what you meant is that you can find links to recipes created by others on your site. 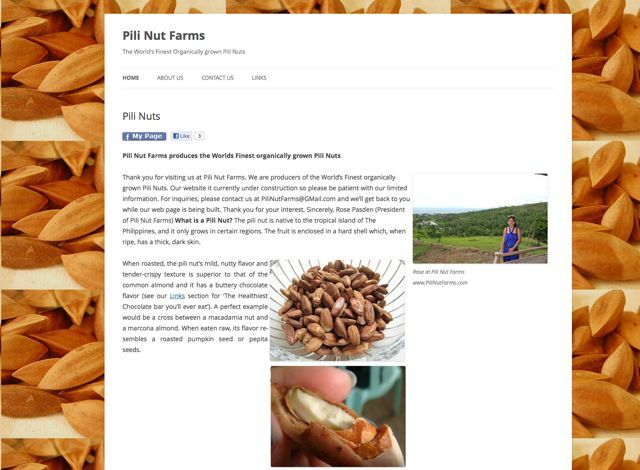 Second, do not use photos of pili nuts on your website that do NOT belong to you, or for which you have not asked permission of the owners of the photos or at the very least, provide a source and acknowledge where you got them from. You did list references for the information you have on the homepage of your website, so I wonder why you didn’t go one step further and include the source of your photos. But this brings up other things in my mind, like if you OWN and OPERATE a pili nut farm, shouldn’t you have EASY ACCESS to and be able to take SPECTACULAR PHOTOS of your own pili nuts instead of lifting them from the net? What kind of credibility do you hope to engender with potential clients if you can’t even show them an actual photo of your pili nuts? Photo # 1 : Raw pili nuts in a Waterford bowl — apparently lifted from Marketmanila.com, post here, the same site you have the gall to then return to, to promote your own commercial pili nut venture! Perhaps you didn’t even know you lifted the photo from my site, because you may have just taken it from google images, where the same photo appears amongst dozens of photos of pili nuts. But then, if that were the case, you conveniently forgot to pay heed to the note on every single photo displayed that says “images may be subject to copyright”. Photo # 2 : Close up of a pili nut from which a bite was taken. Appears to be taken (with or without permission) from the website organicpilinuts.com, possibly a competing business, I gather, that wouldn’t be too thrilled, I suspect. Photo # 4 : Pili nuts spilling out of a glass, apparently taken (with or without permission) from a friend, Joey’s blog, 80breakfasts.com. And I am pretty sure Joey took that photo herself. Rose, I hope your new business thrives and brings employment and benefits to the underprivileged in your home town, as you write and hope it will. I too, believe in KARMA. And I am pretty sure you meant no harm, and were perhaps just careless. But stealing is stealing, and intellectual property rights are something I hope you will respect in future. It’s good business practice, period. awww,there is terrible,mm!i hope this serves as a lesson for everyone! Whoa! huling-huli. Somehow though I feel sad for her. Hindi nag-research, did she have marketing people? Ayyyyy… naku. I-comment pa sa Market Manila site eh ang talas yata ng mata ni MM. Sus. that’s quite a thorough and tactful way of putting things in order, marketman. ANOTHER one!!!???? Unbelievable!! 10 Fishpans for this one…Titigas ulo!!!! Just checked the site. Your photo’s no longer there but the others still are. Maybe she’s waiting to get found out by 80breakfasts and the other sites she got her photos from. Perhaps this is a possible candidate for The Golden Fishpan Award of 2013? Big, big lesson for everybody out there. I manage websites too, this is a very delicate and sensitive area. oh no! be careful of what to post, be it articles or photos, it’s a no no! pag sa libro yan, plagiarism and copyright infringement since may mga owners ang mga photos na yan, lalo na kapag may mga watermarks. to Rose, think before you click! For me, the issue is simple. If you didn’t take the photo yourself, then you better seek the permission of the owner before you use it. In this case, I would have given Ms. Rose the benefit of the doubt, but now that it seems she has simply removed my photo, as she was “caught red-handed” but leaves the other photos up, makes it clear she apparently DOES NOT understand the meaning of intellectual property rights. It’s just pathetic, period. how infuriating! apo pa naman sya ng doctor, as she says on the links page. Ignorance and laziness – Not a good excuse. Is this 2013’s first Fishpan candidate? It’s early enough in the year, there might be more (unfortunately!). Naku, madaming ganyan. Even the people selling goods in Sulit and other marketplace online. Instead of taking a photo of their paninda, kukuha nalang ng picture sa internet. I saw one ad selling Tory Burch flip flops. MM, not just the photos, some of the texts, too. Try this phrase, “complete protein content, vital electrolytes, essential fats and is rich in minerals…” , Google it and you’ll see. Total disregard for originality and/or substance…. maybe rose isn’t really that ignorant — she’s cunning and knew MM has a cult following and wants these followers to view her site once they read MM’s rant. madgewenny, no, I don’t think that’s likely. Having a permanent record on the net of doing something unsavory is not good business sense, regardless of any attention it may get you in the short term. And not with her full body photos, full name and husband’s name and details readily accessible to all on the net. in that case, she harbored ill instead of goodwill for her business. serves her right, to be the runaway winner of your FISHPAN AWARD this year. Fishpan season is here. Good luck Rose with your hard sell marketing of pili nuts. Thanks for posting about intellectual property, etc MM. It frequently happens to us in the crafting world too, stealing tohers’ ideas and calling it their own. If it was really Ms. rose who made her website, she shouldve been very careful and original, especially if its her business. I would like to think that it is more out of ignorance that people violate copyright laws especially here in the Philippines. I can hear you say that ignorance does not exempt anyone and I agree. I work for a graphics firm and I see copyright violated everyday whether it be out of ignorance or blatantly outright. Am glad someone like you can clearly point this out. Manny, I would probably agree that ignorance is more likely the reason. But once pointed out, if a person simply removes one offending photo but leaves others up, I would have to say they are doing that knowing it is wrong. As always, your patience and thoroughness in schooling someone like Rose are commendable. I’d just flip my lid. Thanks for keeping calm and carrying on (and not backing down or giving up), Mr. MM. na, nabiktima sad ko ana, sa pic sa akong leche flan. tapos ingon sa nangawat, kay siya daw nikuha ato nga pic. ingon nako, pati tulo sa caramel, pareho tag kuha? hahahhaa. d na lang jud mag sorry oi, makalagot. Thanks for the heads up MM! Thank you for bringing this to our attention. I was not aware of this practice. I txt our web designer tonight and told him to resolve this immediately.